There's nothing like gathering to make dinner together and then sitting down to dine in your country kitchen. The Amish Country Mission Dining Chair adds a beautiful element to your kitchen scene. 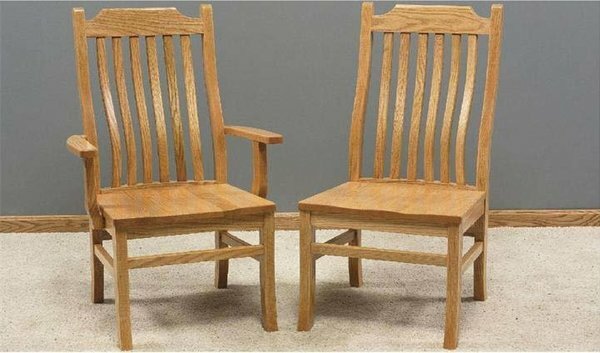 Exhibiting the simple, straight lines of mission style furniture and the durable craftsmanship of skilled Amish artisans, these dining chairs will seat everyone comfortably. Wavy slats in the chair back exhibit true mission style. Select side and arm chairs to complete your collection. Misson dining chairs keep it simple with little decoration. This allows the beauty of your solid wood choice to really shine. If you need help in deciding on what dining chair style you like, take a look at our helpful blog post, "DutchCrafters Ultimate Guide to Choosing the Perfect Dining Room Chair," for help.